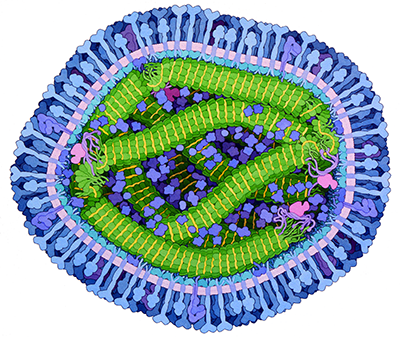 Cross section through measles virus. The virus is enveloped by a lipid membrane (light magenta) studded with many hemagglutinin and fusion proteins (outermost proteins in blue), which together bind to human cells and enter them. The viral genome is a strand of RNA (yellow) protected by nucleoproteins (green). RNA-dependent RNA polymerase (bright magenta) copies the RNA once the virus infects a cell, assisted by the largely-disordered phosphoprotein (purple strands connecting the polymerase to the nucleoprotein). Matrix protein (turquoise) helps the virus bud from infected cells. Several human proteins, such as actin and integrins, are also caught in the budding virus (shown in purple). This painting was created for the Molecule of the Month on Measles Virus Proteins.